GWB: George here, what's happening ? 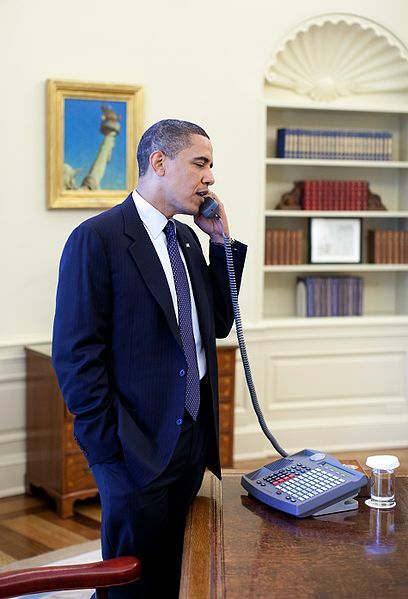 Obama: Hi George, it's me ~ The President ~ just want to go over some details with you before my speech tonight where I'll officially end our combat operations in Iraq. Thought you might like to hear some highlights and maybe even offer some suggestions. Obama: I'm not boy, George ( irritated ) I'm Mr President and since you started this war seven years ago, I felt it was only right I call you before I officially ended it. GWB: I already ended it, Barack ~ you saw my landing on the carrier and the Mission Accomplished banner ~ We got Saddam, We'll still eventually find those WMD's and We got their Oil !! Did you see that contract that Halliburton landed for that huge Iraqi oil field, Wow ! Cheney's beside himself ~ to bad about his ticker ~ probably won't live long enough to enjoy his triumph ~ but I digress ~ so what are you gonna say, boy ? OBAMA: ( long pause ) I want to get beyond Iraq, George , I want to turn the page ~ I want to get beyond our personal differences about how and why we decided to go to war ~ I want get beyond the over l Million dead Iraqis, over 100,000 brain injured soldiers, over 4,000 dead US soldiers and one trillion dollars we have already spent on this misadventure ..not to mention more than half the Iraqi population either dead, wounded, traumatized, in prison, internally displaced, or in foreign exile. GWB: ( angry ) Misadventure !! Do you realize that Tony Blair just wrote in his recently published memoir that I was a true idealist and a man of "genuine integrity and political courage" ~ I don't want you to bad mouth me and mention that the Iraq war was based on a deliberate lie involving the White House distorting the National intelligence estimate on Iraqi Weapons of Mass Destruction ~ It took integrity and moral courage, as Blair said, to attack and liberate Iraq regardless of the collateral damage ~ Remember when Blair said " We have to protect our way of life " ~ Well, you're now living it, Barack ! ( chuckle ) Hang on, I need another cold one and don't forget your promise to Cheney and myself to not open this Iraq can of worms and particularly any re-opening of the 9/11 inquiry ~ be right back. One other thing, Barack ~ When things get tough ~ wrap yourself in patriotism and the flag, pose with the troops ~ after all, you're the commander-in-Chief and no one wants to bash the troops ~ why do you think most of my Photo Ops were surrounded by flags or the troops ( chuckle ) say things like Our troops are the steel in our ship of state or ~ our rod of iron to smite the nations ~ that's Revelations, Chapter 19, The Divine Warrior ( giggle ) Gotta go, be right back with that cold one. GWB: OK, I'm back ~ where were we, boy ? OBAMA: OK, George, I remember my promise to you and Cheney ~ how about this ~ It's well known that he and I disagreed about the war from the onset ~ yet no one could doubt President Bush's support for our troops or his love of our country and commitment to our security. At the end, I'll say ~ Our troops are the steel in our ship of state and though our nation may be traveling through rough waters, they give us confidence that our course is true. Sometimes only parody or satire can illuminate the truth or injustice ~ as in this case where the ending of combat in Iraq masks the continuence of a heavily armed and deadly illegal occupation. The last refuge of a scoundrel is patriotism and both George W Bush and now President Obama have actively sought that refuge.